Bacon and Tomato Quiche was an idea that popped into my head when I was being all amazed at the fact that I have too many homegrown tomatoes on hand--a great problem to have, no? I don't have such a glut of them that I need to can them, just enough that I need to think of new ways to use them so that none are wasted. I also had some leftover buttermilk on hand, and you know how I hate to waste anything, so buttermilk pastry. 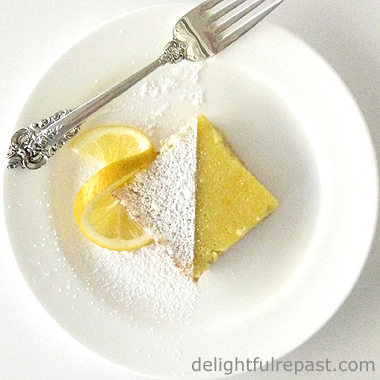 The first time I used buttermilk in pie dough, it was the same situation. And the pastry came out so great, I was really excited thinking I had invented something. But, no, I googled it and found buttermilk pastry was already a thing! Anyway, I also wanted to make just enough quiche for two, so pulled out a Pyrex 207 Petite Pie Plate with scalloped handles. But, as I mentioned in my Peach Pie for Two post, this item has been discontinued. If you don't have it, or can't find a used one, you can order one of these: Anchor Hocking 6-Inch Glass Pie Plate or Fox Run 7-Inch Pie Tin. When I bake or par-bake an empty pie shell, I don't use pie weights and never have any trouble with the pastry slumping down into the dish. That is perhaps because I chill the pastry before rolling it, put it into the pie plate without stretching it, make a lovely high, crimped edge, dock it (poke it all over, sides as well, with a fork) and chill it well again. You can find more detailed directions for making pastry here at my How to Make Pie Crust By Hand tutorial. What are your favorite pastry tips and techniques? 1 In medium bowl, whisk together flour and salt. Cut chilled butter into thin pats. 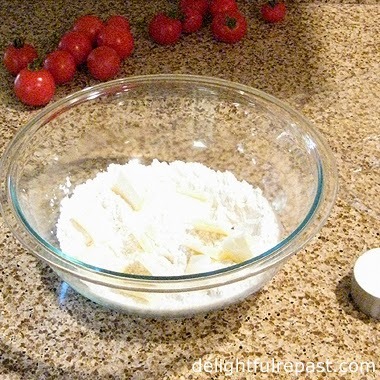 With fingers, quickly work the butter into the flour, leaving some pieces the size of small peas. 2 Sprinkle 3 tablespoons buttermilk over flour mixture while stirring with large fork. Add a little more, if needed. 3 Turn dough out onto a piece of plastic wrap and flatten slightly into an inch-thick disk; double wrap; refrigerate for 1 hour. May be frozen for up to a month; defrost, wrapped, in the refrigerator. 4 If dough is thoroughly chilled, let it stand at room temperature for 10 to 15 minutes before rolling. Don't throw out the piece of plastic wrap; you'll be using it again. Butter a 6- to 7-inch pie plate. On lightly floured surface, roll out disk to an 11- or 12-inch circle about 1/8 inch thick. Place pastry in pie plate, being careful to not stretch the dough. Crimp the edge. Prick the bottom and sides of the crust all over with a fork. Cover loosely with that reserved square of plastic wrap and refrigerate* for 30 minutes. During last 15 minutes, preheat oven to 375 degrees. Bake the thoroughly chilled crust for 20 minutes. 6 Remove par-baked pie shell from the oven; reduce the temperature to 350 degrees. In small bowl (I use a 1-quart glass measure), combine eggs, milk, parsley, salt, pepper and red pepper flakes. Scatter a third of the cheese over the crust, then the onion and half the tomatoes, half the remaining cheese, the bacon and remaining tomatoes, half the remaining cheese. Pour in the filling, and sprinkle with remaining cheese. Decorate the top with some patted-dry thin slices of tomato. 7 Bake at 350 degrees for about 30 to 40 minutes or until crust is golden and a knife inserted an inch in from the edge comes out clean. Let cool on wire rack for about 20 to 30 minutes before slicing and serving. * Vegetarians might like my Vegetable Quiche (and it includes one of my Julia Child stories). There are lots of quiche recipes in Julia's Mastering the Art of French Cooking (2 Volume Set). Thanks, Amy. If you try it, do remember to squeeze and drain the tomatoes so your quiche doesn't have too much liquid. Greg, thank you! I could never quite bring myself to try the Southern tomato pie - what if I liked it?! This just feels a little healthier. Like Amy, I adore more or less any kind of quiche. I'm not sure I've seen "dip and sweep" in a recipe before - great expression! Does it sort of mean heaped? Pauline, I'm glad you asked. I explain "dip-and-sweep" measures on my About page. It means you dip the measuring cup into the flour and sweep the excess (the "heaped") off with a straight edge. Jean, that looks and sounds just delicious. I have never made a quiche! I don't know why, for it can't be more difficult than a pie, can it? And I love making pie. This is also so pretty! Judy, thank you! No, it's no more difficult than a pie - it *is* a pie, a savory pie! A scone like pastry case filled with homegrown tomatoes and bacon sounds perfect to celebrate the harvest, Jean. Your quiche looks superb! Thanks, Angie! I'm going to be so sorry when the tomatoes are gone. I love the idea of making a very small pie crust, so am going to try to find this pie pan. Thanks for the recipe, sounds great! Linda Kay, thanks! Let me know how it turns out for you (AND which little pie plate/pan you get). Okay, I admit it. You lost me after you went to the cupboard. I think I only know what six words mean that start with Q, and quiche isn’t one of them. But that doesn’t mean I don’t appreciate 1) your innovation, 2) your low-waste pantry, 3) your flare for nuanced dishes, and 4) the artistic appearance of your dishes that transcend my imagination. And then there’s the word “bacon.” Had me back on board there and salivating. Plus I’ve always thought buttermilk was underused in recipes. Quiche for two is a winner! Sully, you're always a master at dissing food in the nicest possible way, but you've outdone yourself this time! :D Good to know, though, if I ever had the opportunity to cook for you I could salvage my efforts simply by throwing some bacon into the mix! Mmmm, I've never heard of buttermilk pastry- sounds delightful! I love your creative recipes Jean. I was just talking with a family member at how long it's been since we've made the family quiche recipe- you've inspired me! Melissa, thank you. I do love to go into the kitchen and create. Don't like different for different's sake, but if I come up with something different when trying to make something as good as it can be, I'm all for it! O, MAN.....does this ever look and sound good. I am so going to make this delightful quiche....oh, and buttermilk (sour cream, too) is good in EVERYthing that calls for milk. Pancakes so light, they almost float out the kitchen window...biscuits..OH MY....so so good. I still like to go back every now and then and read your comment on my Southern Cornbread recipe about your parents and their preference of cornbread..so cute. Isn't "too many tomatoes" a wonderful problem to have??? It's been too long since I've made a quiche and yes, I've got tomatoes rolling around on my counters. Thanks for sharing this idea. Lea Ann, thanks! I hope you'll give it a try. Just double everything to make a regular 9-inch quiche. 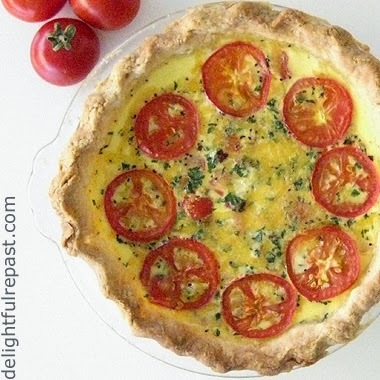 Quiche is a great dish and this one is special because it helps use up the tomatoes. Tomatoes homegrown taste rich and flavorful unlike store=bought. Thanks, Chaya! True, there's nothing like a homegrown tomato! You must have your own vegetable patch. Great one Jean!! A very British thing to do of course. Thank you, Tony! Yes, even when I lack the motivation to grow all the things I'd like to, I usually can at least manage some tomato plants and herbs (basil, flat-leap parsley, dill and cilantro are my usuals; sometimes others). Must plant peas when the time is right; haven't in several years. My ex-husband loved quiche and I do too :) Something he would ask me to cook often. I always made two, one for him and one for me. He liked his with thick bacon which was always too salty for me. I liked mine with vegetables, usually chopped broccoli. And my son, who likes to eat anything and everything....does not care for quiche at all. I don't understand. He likes everything in quiche but doesn't like quiche. LOL! I love dishes like this, and I bet this one is an absolute delight. Thanks for the inspiration! But here's a tip if you like the flavor of bacon, just not the saltiness of it. You can boil the bacon strips for a few minutes before cutting it up and frying it. AdriBarr, thank you! I love the thought of giving people inspiration. Jean, my tomatoes had a late start, but with this delightful recipe, I'll not be short on ideas for how to use the bounty of fruit coming in now. I have to say that was prettier than a picture and I know it tastes better too! Thanks, Chatty! I know you'd like it!